An 'off the record' account of a career newsman. I mention this because at 619 pages in length – ‘The Grapes of Wrath’ is a heavy read. It wasn’t John Steinbeck’s story about Tom Joad and his family’s fight to survive the Great Depression that concerned me, but the six hundred odd pages which lay ahead. So, I put my head down and got through it. Last week, wandering through an illegal Aboriginal tent camp near the centre of Darwin – I could see similarities between the Joad’s and the ‘Long Grassers’ who called the camp home. ‘The word for Long Grasser mean we homeless people – homeless … but we like to use the word Long Grasser’ – is how 45 year old Bob Gallagher describes himself and the dozen Aborigines who live there. Like the Joad’s – the men and women have no permanent place to stay. Fast forward eighty years since the Great Depression and home for these people is anywhere there is a vacant patch of ground to put up a tent. However, the ‘Long Grassers’ have money. The Joad’s were penniless when they were driven off their Oklahoma farm by drought – while the ‘Long Grassers’ have access to regular payments from the Federal Government. This ‘sit down money’ has bred a generation of first Australians – who fairly or unfairly, the majority do not contribute to society. At the Darwin camp, the ‘Long Grassers’ play cards, gambling with the ‘federal cash’. The winner does what the ‘Long Grassers’ call – ‘the rabbit run’, it’s his or her job to walk to the bottle shop and purchase more grog. Lord Mayor Graeme Sawyer believes the influx of hundreds of ‘Long Grassers’ to Darwin is an unanticipated outcome from the 2007 Federal Intervention into Aboriginal Communities. Major General David Chalmers who headed up the Federal Response disagrees – telling me at the recent Bombing of Darwin Ceremony: “People were already on the move .. people are transient .. you can’t blame the Intervention for people wanting to move to the City”. Shoot the messenger or do something about the problem. 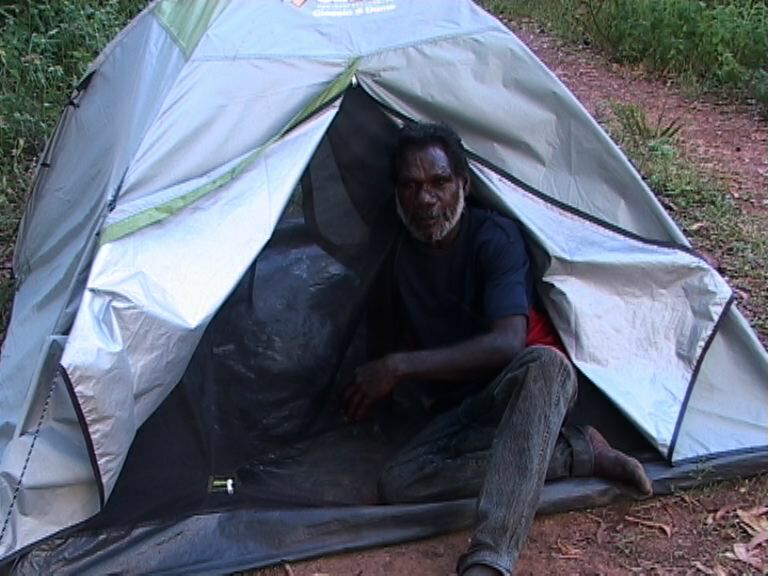 The Lord Mayor wants to build camps with showers and toilets at locations around Darwin, where ‘Long Grassers’ like Bob Gallagher and his friends can live. According to Sawyer: “The various levels of Government need to get together and provide some space where these sorts of camps can be facilitated”. Known for his passion to defeat cane toads – Graeme Sawyer is willing to stake his reputation to solve the ‘Long Grassers’ problem: “We have the same problem with backpacker’s when the dry season comes” – the Lord Mayor says, continuing: “Pretending it’s not happening is not a solution .. the reality is the system we’ve got at the moment is just creating more and more problems”. 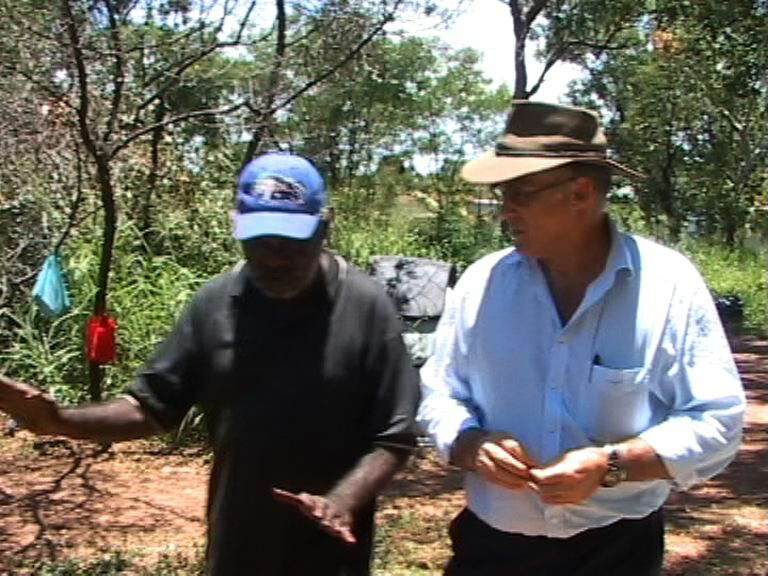 Northern Territory Police, Darwin City Council and the Aboriginal ‘First Patrol’ know the illegal camp exists. However, with the backdrop of Darwin’s housing shortage and skyrocketing rents – everyone allows the campers to stay. The camp can only be described as basic – rough living, there is no running water and the toilet or bathroom is the tall grass surrounding the tents. Bob enjoys a drink, is a diabetic and he recently had his left big toe amputated. He worries he’ll get sick if he continues to live rough. 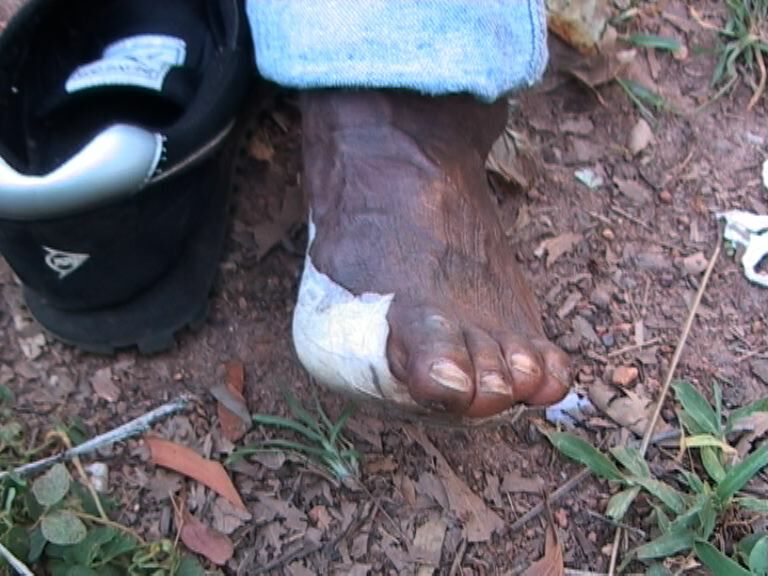 “I’ve got to go to the hospital for a check up, because I’m living in the bush .. It’s not a nice place to stay, we put in for a house last year and we’re still waiting” – Bob says as he holds a plastic measuring cup filled with ‘watered down’ Port. Australia is often referred to as the lucky country – I don’t think Bob considers himself lucky. Maybe one day – the ‘Long Grassers’ will find a home or society will persuade these modern day ‘Okies’ to change. It’s not going to be easy. As someone once said to me, if you can read you can cook. My reply was, try reading ‘The Grapes of Wrath’. This entry was posted on Sunday, February 21st, 2010 at 2:29 PM and is filed under Uncategorized. You can follow any responses to this entry through the RSS 2.0 feed. You can leave a response, or trackback from your own site.